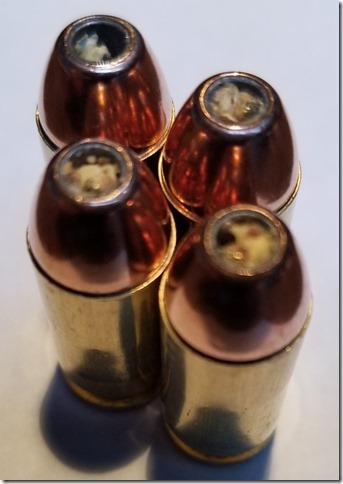 This entry was posted in Gun Rights, Reloading by Joe. Bookmark the permalink. Stores here don’t sell them any cheaper than XTPs. Is there any reason to buy HAP over XTP? Brownell’s sells the HAP for a little over $0.15 each in bulk after shipping. XTPs, again from Brownell’s, in the same quantity are over $0.25 each after shipping. The HAP has a better profile for reliable feeding. Other than those two items I haven’t compared them in detail. That debris could cause magazine jamming if it comes free, and also cause feeding problems if it comes loose during chambering, stopping the round from fully chambering. Both scenarios are a recipe for disaster during self-defense use, in addition to your intended game use. Excellent point. I had not thought of that.